Pop star Ariana Grande is singing her heart out. During her Wednesday, Nov. 7, 2018, appearance on The Ellen DeGeneres Show, the 25-year-old singer performed her new hit single, "Thank U, Next," for the first time while channeling the 1996 movie First Wives Club. With the help of her friends and backup singers, Victoria Monét and Tayla Park, Grande delivered a wedding-inspired, choreographed performance as the trio rocked all-white outfits. However, just weeks after calling off her headline-making engagement with her ex-fiancé, comedian Pete Davidson, the songstress noticeably became emotional and teared up during a lyric which referenced her future wedding: "One day I'll walk down the aisle / Holding hands with my mama / I'll be thanking my dad / 'Cause she grew from the drama." Ever the pro, she powered through the rest of the performance. As Nicki Swift previously reported, Grande dropped "Thank U, Next" just this past weekend. Marking the start of the next chapter in her life and career, the track reflected on the woman she's grown into due, in part, to the lessons learned from her high-profile romances with the likes of Davidson and the late rapper Mac Miller, whose untimely death was recently ruled as an accidental drug overdose. Grande, who was named Billboard's Woman of the Year, later tweeted that her exes "heard it before it came out." Following the "Breathin'" singer's world premiere performance, titular host Ellen DeGeneres told Grande, "Thank you for being here. That was amazing! That was awesome. You've had a rough year. We all love you. We support you." For his part, Davidson, 24, recently addressed his and Grande's split during Saturday Night Live's "Weekend Update" segment on Saturday, Nov. 3. "I know some of you are curious about the breakup, but the truth is, it's nobody's business, and sometimes things just don't work out, and that's okay," he told the audience at the time. "She's a wonderful, strong person, and I genuinely wish her all the happiness in the world." Despite calling it quits, it sounds like Grande and Davidson are thankfully on the same page. 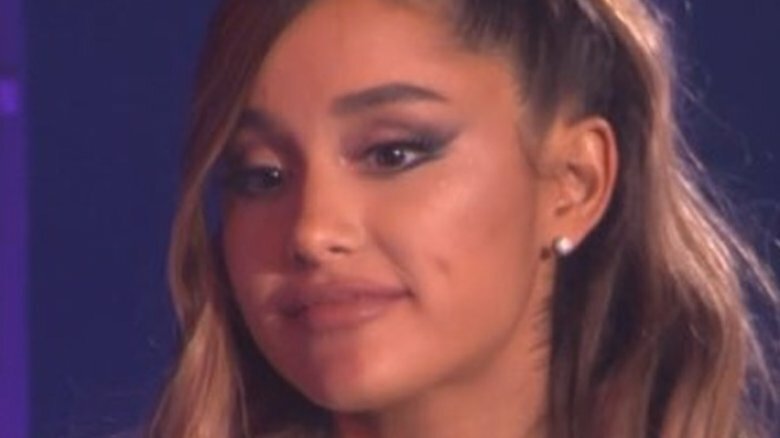 As the "No Tears Left to Cry" hitmaker tweeted alongside a heart emoji around the time of her new song's release, "No drags…. no shade….. jus love, gratitude, acceptance, honesty, forgiveness … and growth."